two, add some avocado, and you have a star. This is hands down one of my favorite hot sandwiches. I first had it at a small seafood restaurant in Santa Monica, and its impact was enormous. It’s incredible. These are all easy, but it’s import to note that ALL components of the dish are important, and should be isolated. My tuna salad is nothing special, except that I like to add a little cilantro and lime juice. It brightens the entire dish and adds a complimentary flavor to the avocado. I like to cook the sandwiches wrapped in foil and in the oven to ensure that they cook slowly, evenly, and the bread does not burn. Think Cuban style pressed sandwich. The avocado rounds off the sandwich, adding an almost creamy aspect. It’s a great and easy sandwich to make. It’s delicious, and I hope you like it as much as I do. Mix the tuna with the onion, celery, and cilantro. Add the lime juice and mayonnaise. Mix thoroughly with a folk. Season with salt and pepper. Reserve. Heat an oven to 400. Begin heating a large heavy bottom oven safe saute pan over medium heat. 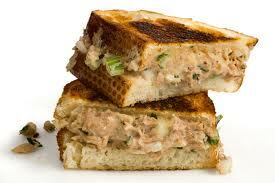 Lay the bread out on a cutting board and place an even layer of the tuna salad on the bottom of 2 pieces. Place the cheese over the tuna. Top with an even layer of sliced avocado. Top the avocado with bread and lightely butter both sides of the sandwich. Tightly wrap the sandwiches in aluminium foil. Place the sandwiches in the hot saute pan. When you hear the butter cooking, flip the sandwiches, and place the saute pan in the oven. Cook for about 15 minutes and flip the sandwiches again. Cook for another 10 minutes, remove from the oven, remove the foil, slice the sandwiches in half and serve. This entry was tagged Easy, Melt, Sandwich, Tuna. Bookmark the permalink.